Nissan has just announced a new marketing campaign that uses its social channels to allow fans to help customise and name a one-off version of the Juke Nismo. The campaign, which is fronted by ex-F1 driver Johnny Herbert, asks fans to contribute ideas for the kind of technology that should be incorporated into the car using the hashtag #Jukeride. The idea is to use digital technology to help Nissan’s professional driver’s improve their skills, while also allowing the brand’s social community to get involved with the development process. A key part of the campaign involves a companion remote control helicopter that takes off from the roof of the car and tracks the driver’s performance while also providing unique footage of motorsports events. It’s not the first time that a car brand has used crowdsourcing as part of product development, but it’s certainly one of the most ambitious examples that I’ve heard of based on the fact that it relies on fans to have some level of knowledge of car design. Another example of a car company buying into crowdsourcing, Citroen launched a Facebook app last April that allowed users to choose the design for a special edition of the company’s new C1 city car, called the C1 Connexion. The app allowed users to provide input on six elements of the design – the number of doors; the exterior and interior colours; equipment such as Bluetooth or satnav; and alloy wheels. Each car submitted counted as a vote and the combination of colours and features that are most popular were incorporated into the final design. The final design, taken from more than 24,000 configurations created within the app, was an unimaginative black car. In March last year pharmaceutical company Boehringer Ingelheim partnered with Kaggle, the platform that uses gamification to solve complex scientific problems, to create a new model relating to molecular development. The company wanted to use knowledge from the online scientific community to create a new model to help its scientists accurately predict the biological response of molecules. Contributors were given until June 2012 to come up with a working model and share a prize pool of $20,000. Information on whether the initiative was a success is difficult to find, but it’s interesting to note that a pharmaceutical company has puts its faith in the wisdom of the crowd. Way back in 2011 VW Canada ran a campaign that asked its Facebook fans to help choose the script, cast and music for the third chapter of its ‘Drive Until’ ad series. The idea was to create a social ad – Volkswagen means ‘people’s car’ so this was to be the ‘people’s advert’ – so the best ideas were incorporated into the final creative. The winners were also thanked in the credits at the end of the ad. For some reason the final two-minute ad is no longer available online, but this 47 second version gives you the basic gist. When Levi’s wanted to find a new star for its 2012 marketing activities it decided to run a crowdsourcing campaign using Instagram. The jeans brand asked people to upload images of themselves onto the social network and tag them with #iamlevis. During the contest people shared more than 3,513 Instagram photo entries, which was a decent response at the time as Instagram was still only available on iOS. The winner then took centre stage in Levi’s 2012 ‘Go Forth’ ad campaign. Expedia launched a new crowdsourced deals feature on its US site last year that automatically identifies the best deals found by other travellers for hotels rooms and flights. It is done anonymously in the background so doesn’t require any additional action by Expedia customers. The service picks the top six deals based on your location, with the options filtered into three categories: tonight, this weekend or next weekend. It’s perhaps not crowdsourcing in the traditional sense of the word as those involved aren’t consciously contributing to the system, but at the time Expedia said it differs from other flash sales programmes as the selections are not driven by a sales team or suppliers, but found by other customers. APAC director for sparkling and activation platforms Leonardo O’Grady told us that the brand had trouble cracking some positioning for Coke, so opened it up to the creative community through co-creation agency eYeka. It received around 3,600 responses that it whittled down to a shortlist of 10, with one eventual winner being aired in Asia. The winning ad outperformed a lot of Coca-Cola’s commissioned work based on Millward Brown’s Link Score and the brand achieved a 900% productivity gain against briefing through traditional means when taking into account all the costs of using co-creation versus its usual agency and production fees. In the run up to Christmas 2011 bakery chain Greggs asked Facebook fans and Twitter followers to submit ideas for a festive song as it looked to “capture the festive spirit of customers” and raise money for forces charity Help for Heroes. The resulting song, inspired by what makes Christmas special for Greggs fans, was recorded by indie band Silvers and released on iTunes. The concept was developed by digital agency Steel, which created a character named Festive Jake the Festive Bake to front the campaign. Beauty brand Bobbi Brown ran a Facebook promotion to crowdsource which shades of lip colour the company would put back into production. CEO Bobbi Brown posted a video on the company’s Facebook wall, inviting its near 250,000 fans to vote for their favourite from a list of the 10 most-frequently requested colours. Voting was open to those in the six countries Bobbi Brown Cosmetics sell to online; the US, UK, Korea, Japan, Germany and Australia. The products were then available to buy exclusively through Facebook. Furthermore, the research found that for two-thirds (66%) of client-side respondents, both improved business performance and customer experience are the main drivers for personalising the website experience. 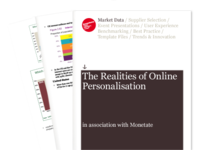 The Realities of Online Personalisation is based on a survey of more than 1,100 digital and ecommerce professionals working for brands and agencies, carried out in February 2013.